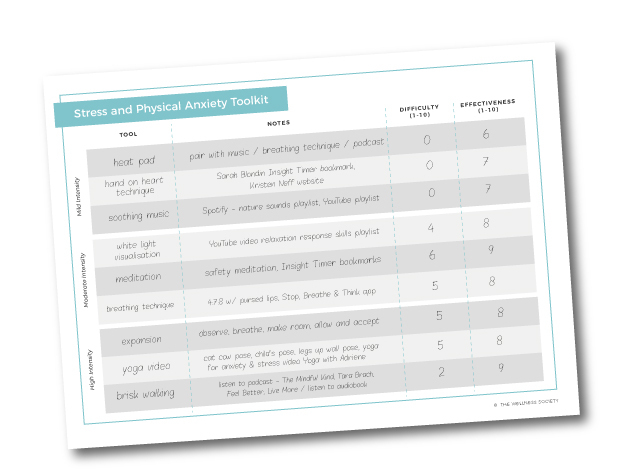 Robert Leahy, the author of The Worry Cure, created this technique for overcoming mental anxiety. Worry Time involves starting a habit of writing down your worries throughout the day and reviewing them at the end of the day. Aim to do this exercise daily for at least one week to see real positive change. Schedule 15-30 minutes Worry Time in your diary, avoiding just before bedtime. Make a note of your worries during the daytime. When you find yourself worrying about things you’ve already made a note of, remind yourself that you will focus on it at Worry Time (you may have to do this repeatedly). During your scheduled Worry Time, you might also like to experiment with methods for cultivating your cognitive restructuring skills. Do a weekly review to spot any patterns.